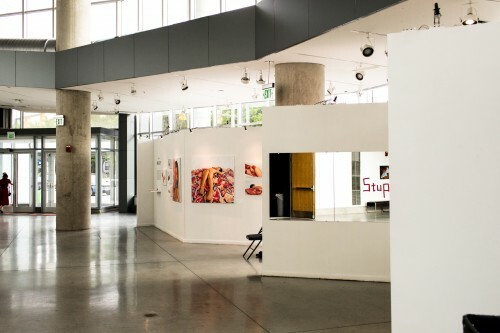 The Student Space Galleries consist of four separate gallery spaces on the MICA campus dedicated exclusively to showing student work throughout the year.. The Meyerhoff House is home to the Piano Gallery. This space is located on the first floor of the building. It is a versatile space that is ideal for displaying paintings, illustrations, photographs and some sculptures. The Bunting Center holds the Pinkard Student Space Gallery. This gallery is located on the first floor of the building across from the Decker Library. This space is most conducive for works of video, interactive media, installation, sculpture and fibers. This is the only gallery that can be painted. The newest building on the MICA campus, The Gateway, is home to the final two Student Space Galleries. Both galleries in the Gateway can be found on the first floor, outside BBOX Theater. These two gallery spaces are best suited for two dimensional work, sculpture and installations. Larger pieces work extremely well in this open space. Students may propose their ideas for altering any of these spaces to the Exhibitions Department. All spaces must return back to their original state as part of the student's de-installation process. The Exhibitions Department will lend advice - however, they will not install the artwork. Students may check out tools through the Exhibitions Department or borrow a toolbox from Student Activities with a valid ID.